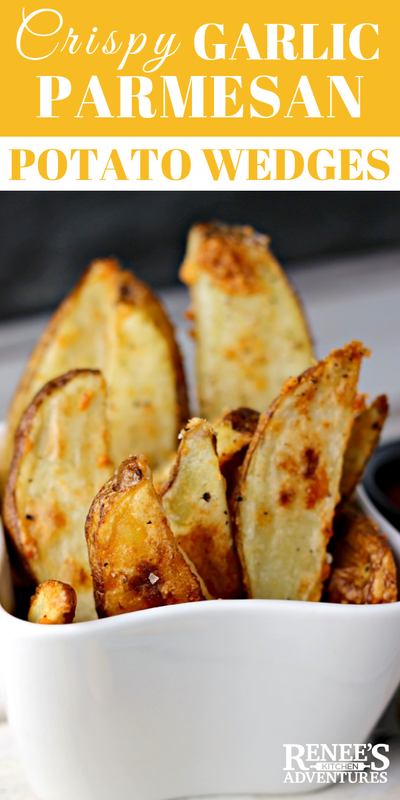 Crispy Oven-Baked Garlic Parmesan Potato Wedges are one of my favorite side dishes! There is a secret to achieving the perfect crunch with these babies, and when you taste them, you will swear they were fried. The addition of garlic and Parmesan cheese take these over the top! 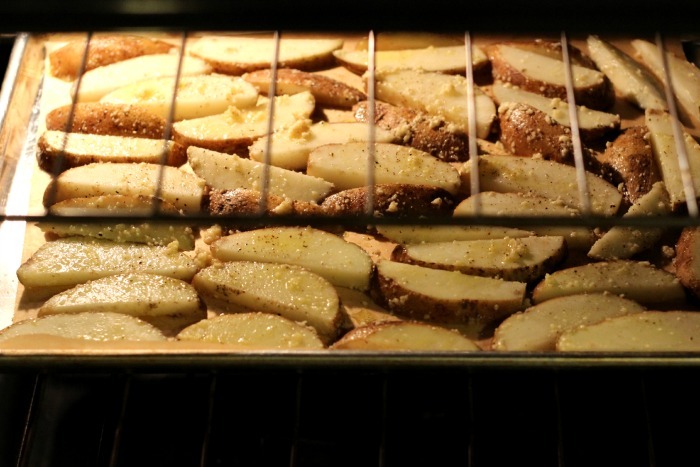 How do you make Garlic Parmesan Potato Wedges in the oven? 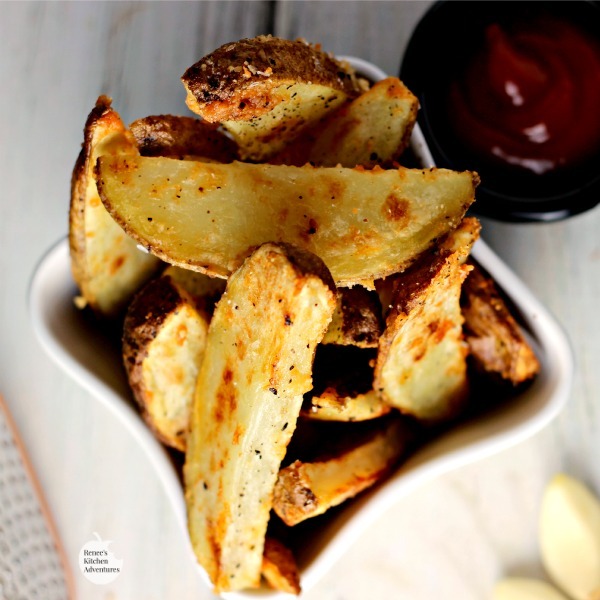 These potato wedges are really very easy to make, however they do require a bit of planning. Choose the right potato. 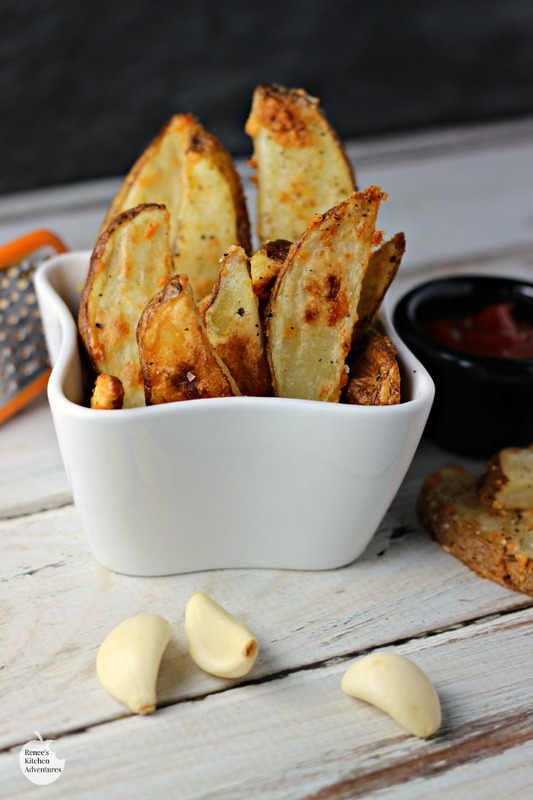 Russet potatoes are the best choice for these Garlic Parmesan Potato Wedges. Make sure to choose potatoes that are free of blemishes and green spots. A few weeks ago, russet potatoes happened to be on a super sale at my market. I grabbed a big 10# bag for $2.00! I knew oven baked potato wedges would be on the menu, but wanted to kick them up a notch in the flavor department. That's when I decided to take them to the next level and turn them into Garlic Parmesan Potato Wedges. What a great flavor combo! The Parmesan cheese gets nice and toasty brown on the fries, giving them an extra layer of crunch. Make sure you use a Silpat liner, a layer of non-stick foil, or a sheet of parchment on the bottom of the pan to make clean up easy. The Parmesan cheese that doesn't stay stuck to the fries does sneak to the bottom of the pan and can stick. If you've ever had to clean baked on cheese off a pan before, you know what I am saying here! 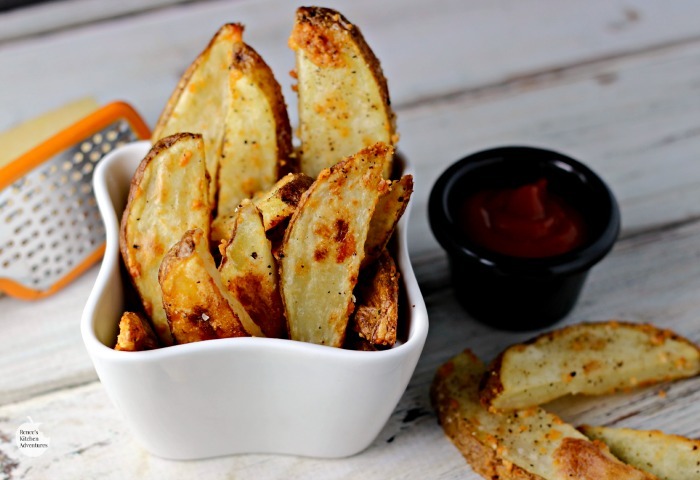 Give these DE-licious Garlic Parmesan Potato wedges a try tonight! You will love them and so will your family. 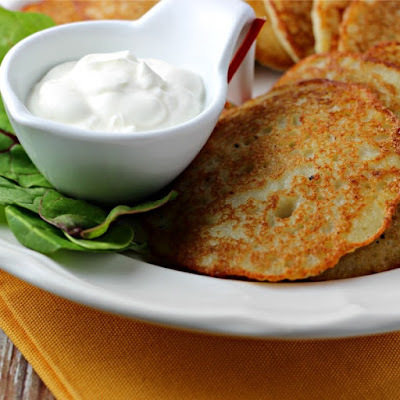 And...because they are oven "fried" they are a healthy choice too! Garlic and Parmesan cheese turn ordinary oven baked potato wedges into an extraordinary side dish everyone will love! 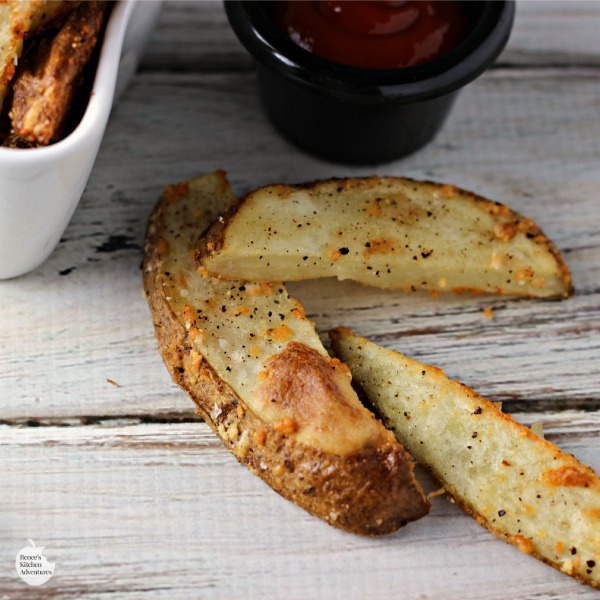 Cut potatoes into wedges by slicing in half and then into 1/4" wedges. 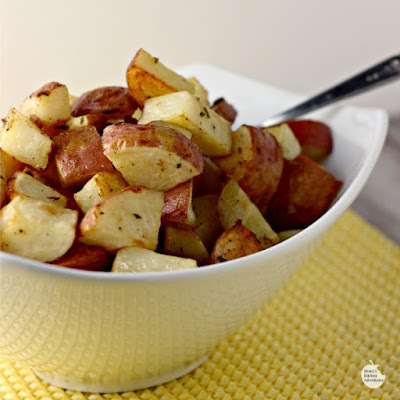 Add cut potato wedges to a large bowl and cover completely with cold water. Set aside for 30-40 minutes. Preheat oven to 450 degrees F. Line large baking sheet (or two if needed) with Silpat, non-stick foil, or parchment paper. Set aside. Drain potato wedges. Take paper towels and dry potatoes well. You do not want them wet, or they will steam in oven and not get crispy. To large bowl, (you can use the same one you soaked the potatoes in if you dry it well), add potatoes, olive oil, garlic powder, and Parmesan cheese. Mix well and dump onto prepared baking sheet. Bake in oven for 30-40 minutes or until wedges are nicely browned. Serve immediately. *I'm not going to supply nutrition information, as it will vary with the size potato you use. Renee's Notes: Oiy! It's been super busy this summer, but unfortunately not so much in my kitchen! As usual, my kids are keeping me busy with all their moving and life events and that is why posts have been a little scarce lately. I am so blessed with so many wonderful things in my life...but like always, it seems to go by so swiftly. I'm trying to savor every moment as it goes by in a blink of an eye! Looking for more potato goodness?